Cartoons are often designed to make you laugh. Sometimes they’re intended to hold something up to ridicule to expose its bad characteristics. In any case, cartoons aren’t normally something you’d think of in relation to your current job or your overall career. That said, it can be therapeutic at times to be able to laugh at situations you’ve experienced in your job search or career. You might also get a heads up about something that could happen unless you’re careful about the actions you take. 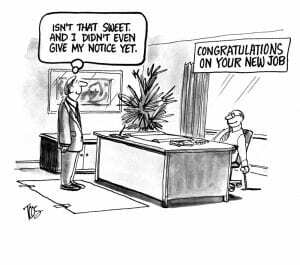 So, with just a bit of tongue-in-cheek, I’d like to venture into the world of career management and job search planning from a cartoonist’s perspective. When you’re gainfully employed and want to stay that way until you land your next job, confidentiality is critical to your job search. The last thing you want is to have your hand forced and resign before you’re ready–or have your employer make the decision for you! Use caution about the people you choose to confide in, especially within your current company. Refrain from using any employer resources to help conduct your job search–including computer, phone and (it should go without saying, but doesn’t always) company time. Beef up or simply refresh your LinkedIn profile well before you want to start job searching and keep it maintained periodically, so it doesn’t signal a planned search. Continue to give 100% value in terms of your responsibilities, so your employer views you as fully invested in making a worthwhile contribution. Unless you have a really close connection that will snag a coveted interview for you without a great resume, you need your professional resume to present you compellingly and make you stand out from the herd. It’s not enough for you to be “as good as” many of your competitors; you must in some clear way outshine their value presentation. Otherwise, the process becomes a case of “cut off when we reach a certain number of candidates” or “let’s flip a coin.” You do not want to be blindsided by that and become a job search victim. If you can’t be bothered to take enough time to figure out your unique value proposition and find a way to present it in an appropriately attention-getting manner in your resume (and, yes, on LinkedIn, too), you need to understand an important point: One or more of your competitors will. 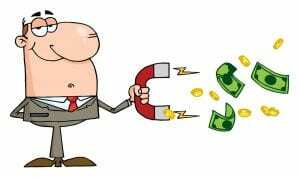 Does Your Value Attract Employer Money to You? Unfortunately, you don’t automatically capture a high salary offer simply because you have strong value to bring to an employer. 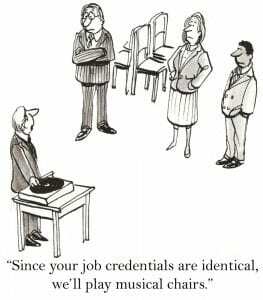 That’s only one of several reasons it’s essential to prepare properly for interviews. You need to develop a realistic view of your qualifications–particularly those that could give you an edge over your competition–and understand their probable worth in the employment marketplace. However, that’s not enough by itself, either. Knowing your value and knowing how to communicate it to potential employers before, during and after job interviews plays a critical role in your odds of success. The more you can convince employers you will be a valuable asset–one they’d be crazy not to grab–the more likely it is that you’ll be able to generate a desirable compensation package. 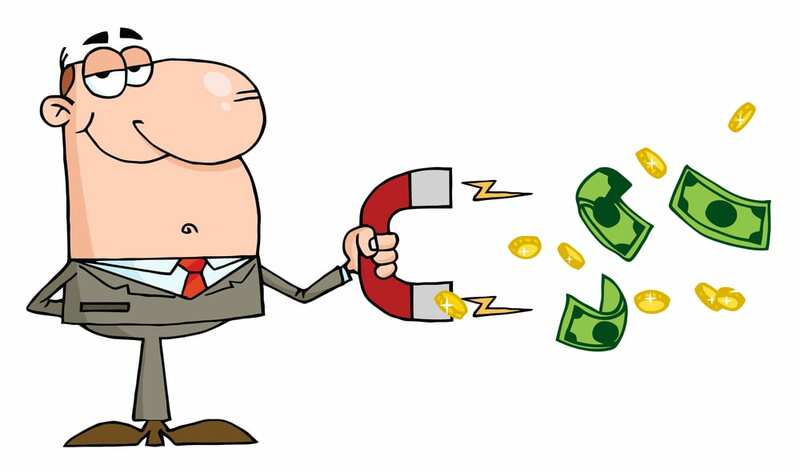 Value + Compelling Communication = Money Magnet (or at least it can!). ← Are You a High-Engagement/High-Burnout-Risk Employee?